North Fitzroy residents were alarmed to learn that VicRoads still had a proposal to build a six lane arterial road between Hoddle Street and Holden Street in North Fitzroy. 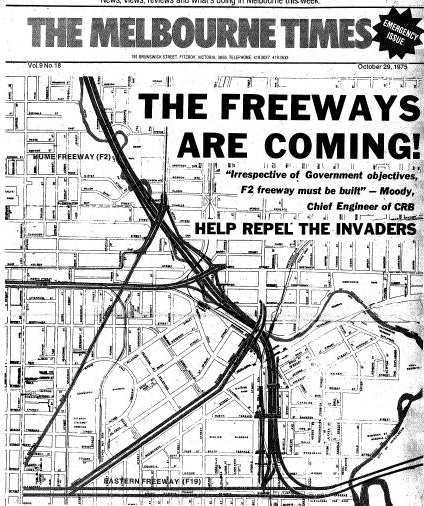 The proposed freeway plan has been in their file since 1969, the freeway with massive interchanges was shown in extraordinary detail on the front cover of The Melbourne Times in 1975. The route was surveyed in 1972 by VicRoads. These photos come from that survey. Only a sustained community effort stopped the freeway then, just as it stopped the East-West tunnel in 2008. But VicRoads only filed the plans away for an opportune time to bring them out again.